The history of Glasser Bows is one that combines this total commitment to quality with a passion for innovation. Our company traces its roots back to 1938, when Leon Glasser began handcrafting wooden bows in his small Bronx, New York workshop. Much has changed since that time. Glasser has progressively replaced wood with synthetic materials, first with fiberglass, then carbon fibre. Our patented braided carbon fibre process remains unique to Glasser Bows. Our company has been responsible for many "firsts" that have revolutionized bow making. In 1962, Leon Glasser and his son Ray invented the fiberglass bow, and were awarded a patent for their work in the U.S., U.K., France, Germany and Japan, ushering in the era of the synthetic bow. Meanwhile, CNC machinery has brought new levels of precision and consistency to the bow making process. Our state of the art facility in Baja California has expanded our capacity to provide faster service and shorter lead times, including the reconditioning of used bows. Still, there are some things about Glasser Bows that have remained unchanged. Our commitment to excellence is as strong as ever. Our company is still based in the Bronx where all of our high-end custom bows are produced and all Glasser bows are subject to very strict quality control. 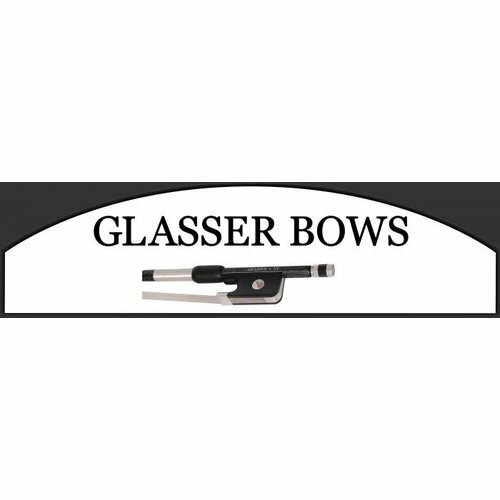 Glasser bows are made to conform to the strictest standards under the supervision of Leon's grandson Andrew Glasser, who heads our business today. Glasser Bows believes strongly in the quality of our products. With all bows made in our own North American facilities, we offer a limited lifetime warranty against any manufacturer’s defects on all Glasser bows. This guarantee does not cover normal wear on horsehair or damage caused by abuse or neglect. We take pride in our products and will always make sure our customers are completely satisfied with their bows! Responding to requests from our customers, Glasser has continued to diversify its product line by adding a full range of accessories, including composite tailpieces, Planetary Pegs, music stands and tuners, and bass transport wheels. We are also the exclusive North American importer of the world renowned Larsen strings, which also includes the Magnacore, Crown, Tzigane, and Virtuoso brands. Glasser will continue to lead the way in the future, bringing innovative ideas to bow making. Our devoted customers would expect nothing less from the company that has set the standard for excellence in stringed instrument bows for over seventy-five years.